We are dealer trained providing roofing on Commercial and Industrial buildings. We provide roofing services throughout Fox River Valley. 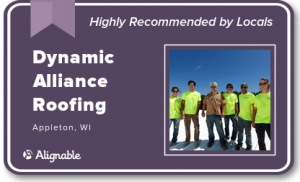 Dynamic Alliance Roofing is based in Appleton WI, serving the Fox River Valley and surrounding cities. With over 25 years of experience in the roofing industry, Dynamic Alliance Roofing is dedicated to unsurpassed customer satisfaction. 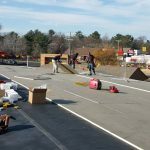 We provide all of your commercial & residential roofing from flat roof replacements to new construction roofing installations. During September we are offering free estimates. Duro-Last® has become the nationwide leader in single-ply roofing systems, providing the best warranties in the Roofing industry. Our goal is to be the most professional roofing contractor in the area, the best at what we do, and to exceed customer expectations. Some Roofs need insulation and can have no fasteners as well into the Roof deck. 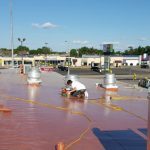 For this situation we use Expandable Polyurethane Closed Cell Spray Foam; Sprayed Polyurethane Foam (SPF) The 3-lb closed cell foam is used for roofing in conjunction with a cover coating. This produces a very durable, long lasting roof that can be applied over many different substrates. The SPF is "Fully Adhered", seamless and stops all drafts wherever is is sprayed. SPF with a covering coating makes a excellent choice for an insulated sustainable roof system. Dynamic Alliance Roofing is owned and operated by Thad and Ruth Brown. Their son, Micah, and daughter, Leah, also play an integral part of everyday operations from Roof installations, project oversight, and office management. We’re proud of what we’ve built together and invite you to discover how our family can protect your Roof. We believe nothing speaks louder than a job well done, and we’re proud of what our customers have to say about their experience with our Roofing application. Referrals drive our business and we strive to be a trusted in Roofing contractor in protecting our customer’s assets. We understand that providing top-tier Roofing service isn’t possible without staying ahead of the curve. That’s why we’re dedicated to achieving proficiency and certification in all the latest Roofing technologies the industry has to offer.